Socialising puppies is very important. A good socialisation means that in the future you can have a nice family dog that deals well with other people, animals and changes in the environment. To be able to socialise your puppy well, it is important to know something about the development and socialisation of a puppy. The socialisation phase of a pup can roughly be divided into 2 phases. The first phase of socialisation between the ages of 3 -12 weeks. The second phase of socialisation between the age of 12 weeks - 6 months. This can be seen as the curious phase, as puppies in this phase are curious about new things. They have to be introduced to all sorts of things at this stage. They have to learn that all kinds of stimuli are not scary. The rest of the outside world has to become 'normal'. This phase should happen quietly and your pup should get sufficient time to get used to new stimuli. It is important that this is not rushed and that you allow a pup to get acquainted repeatedly. It is also important not to offer too many stimuli after each other. 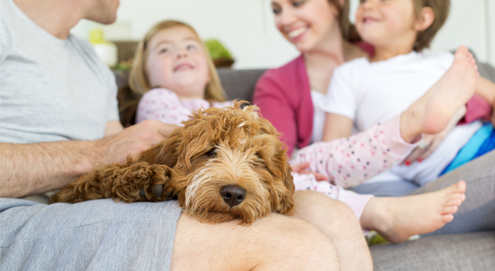 Your pup should get sufficient time to relax again. If your pup anxiously reacts to stimuli, then your pup is not quite prepared. You can pick up your pup at such moments and move him away from the stimulus. Simply try it another time and start quieter, for example at greater distance. This phase is seen as the fear phase. Your puppy becomes suspicious of everything he came into contact with in phase 1. The pup has to learn that everything he has ever been confronted with is not dangerous. Therefore, repeating the same stimuli is very important, especially in this phase! This is also the phase where a puppy can become permanently afraid of certain things through a traumatic experience. Your puppy usually arrives at the end of the first socialisation phase at your home, the new boss. Now he has to learn what is 'normal' within the household and become familiar with the routine within a household. We will explain why these points are particularly important in socialisation below. To a dog, a child is not seen as a small human being. A dog who has no experience with children can see a child as a threat. They can even develop aggressive behaviour towards children if they do not learn that children (in most cases) are not dangerous and often a very nice companion to play with. If you do not have children yourself, it is important to look for places where many children go, for example a schoolyard. Every dog will have to visit the veterinarian practice to a greater or lesser extent. It is a good idea not to wait the very last second. Regularly visit your vet to weigh your pup and receive a dog treat, such as those from Edgard & Cooper or Fish4Dogs. This way your pup will learn that a visit to your vet can be very enjoyable. There are many different dog breeds and every dog looks different. Pups have to learn that all those other breeds are also 'normal' dogs. Don't wait with making contact with other dogs until all vaccinations are completed, because by that time the first socialisation phase is already over! Of course, don't go to a busy meeting place, but see if you can meet up with friends who also have dogs and of which you know that they are vaccinated properly. Make sure to ask in advance if the other dog can handle puppies well, to prevent a traumatic experience. Which other things your pup should definitely come into contact with depends on your environment! What to do if your puppy has a bad experience? If your pup is shocked by an experience, it is recommended that you look up a similar situation as soon as possible and make it fun by rewarding your pup positively. Does your pup get scared of a truck, go to a busy road again, but keep some distance in the beginning and play with your pup or give him something nice if he does not react anxiously. Prevent an unpleasant event from becoming a traumatic experience. This also applies to a negative encounter with, for example, a larger dog. Within a day, look for a dog of the same breed that is pup friendly and make the experience enjoyable. Start in time with socialising and keep repeating! Be sure to continue socialising until adolescence, at least until he is one year old. This way he keeps learning that new things are not scary and you can respond to behavioural changes in time. It is very important to make sure your puppy has the right diet, so any food allergies or hypersensitivities (coat or skin problems, digestive sensitivities, etc.) can be prevented. Not sure which food is suitable for your pup? Contact your vet or have a look at Royal Canin's puppy food range, which includes dry food and wet food for all types of puppies. Are you not sure how to handle the raising of your puppy? A puppy training can help. Get (contacting your own vet or other dog owners in your area) informed about the possibilities of a puppy training in your area and have a look around. Not everyone likes the same way of training. The approach of the puppy training should suit you, otherwise your puppy will not learn anything! Soft harness with adjustable webbing & breathable air mesh material. Complete milk feed based on whole goat's milk. Soft, flexible toy that helps puppies losing their milk teeth. Really cute cuddly toy that can be used as a pillow. Pads for potty training and incontinence in dogs . Soft cuddly toy with beating heart. Complete milk replacer for puppies from birth until 3 weeks. Puppy Training Course, Yes or No?